No reviews found on the web, but a few mentioning as “Holy Grail” of 6DJ8 tubes. Read our reviews. This entry was posted in Vacuum Tubes and tagged 6DJ8/ECC88, Amperex by tubemaze. Bookmark the permalink. The best of the best of 6DJ8 tube – as rare as they come. The tubes is fantastic. All is there, very natural, very transparent, with beautiful, sweet top end and firm controlled bass. Mid-range is very natural with just a touch of tube warmth. Sound stage is superb. Very large, melting speakers in to a single sound presentation – incredibly 3D. Vocals come through very delicately. Really hard to find any faults with the tube. Very expensive, but a fantastic tube. HIGHLY RECOMMENDED. The Dutch Amperex Pinched Waist 6922 is indeed the stuff of legend; I totally agree with the above sonic evaluation by Tubemaze… The Amperex Pinched Waist 6922 is almost unbelievably transparent sonically and also has pitch-perfect frequency response and wide bandwidth that is balanced from the lowest bass to the upper reaches of its’ extended, airy treble. Best of all, the Pinched Waist 6922 resolves even the smallest, most recessed micro-details in music into a palpable, almost holographic soundstage. The Pinched Waist 6922 really does do it all; BUT– I have to caution about certain realities of the marketplace for tubes as rare as the Pinched Waist Amperex 6922. These tubes have long been hunted to virtual extinction, and because of the combination of the scarcity of NOS stock of these tubes for sale and their excellent sonic performance, the selling prices for these gold-pinned gems have risen to rather extreme levels. It is not at all uncommon to see Dutch Amperex Pinched Waist 6922s selling for $325 to $425+ EACH if the tubes are properly audio tested and truly 100% New Old Stock/New In Box in the original green and yellow Amperex boxes with all of the chalky white printing on the tube itself intact. Most important for audiophiles purchasing tubes as rare as the Pinched Waist 6922: At these prices, audiophiles really have to be certain that the Pinched Waist 6922s they are buying are not excessively noisy or microphonic.. Both of these tube noise issues, if present, would make them totally unsuitable for usage in a phono stage or in high-gain line stage preamps. Basic tube testers don’t reveal such noise issues at all and even top tier test equipment does not always reveal “in circuit”/real world tube noise issues with the 6922 family of tubes (6922, 6DJ8, 7308, Cca, E88CC, etc) Therefore, I would recommend that audiophiles ONLY buy Dutch Amperex Pinched-Waist 6922 tubes from sellers they trust… in particular, sellers who have installed their 6922 tubes into an actual audio circuit to screen them for internal tube noise. This is especially important with small signal tubes like type 6922 that are intended for use in preamplifiers and the input stages of amplifiers, because tubes in such applications in particular need to be screened for noise issues like “tube rush”–(that white noise that can sound like rustling leaves or crashing ocean waves in particularly noisy tubes), and also for performance crippling, music distorting microphonics. Microphony, or microphonics, is just what the word sounds like. The tube is literally acting like a microphone, amplifying small vibrations present in the equipment or picked up from the speakers… and transforming these small vibrations into a ringing, or whistling/squealing sound that absolutely spoils delicate musical passages, smears low level details, and can even damage loudspeakers in extreme cases. By the way– there is a persistent internet myth that “small amounts of microphonics are actually desirable and give the music a sense of air and space” This MYTH is Absolutely False. Put simply, microphonics are a type of distortion, and distortion has no place in high fidelity. There are tube vendors who audio-test their tubes in actual circuits, and I would recommend that audiophiles ONLY buy tubes from these vendors. When tested and functioning properly, the Amperex Pinched Waist 6922 is absolutely magical. These rare tubes are indeed expensive, but the expense IS proportional to the excellence of their sonic performance, and the 6922 tubes typically do last a very long time. Just as with other categories of high cost/high performance audio essentials: If the cost is acceptable to the audiophile making the purchase, the Pinched Waist Amperex IS INDEED “the” 6922 tube to seek out; the Pinched Waist 6922 absolutely is the best of breed/best in show 6922. 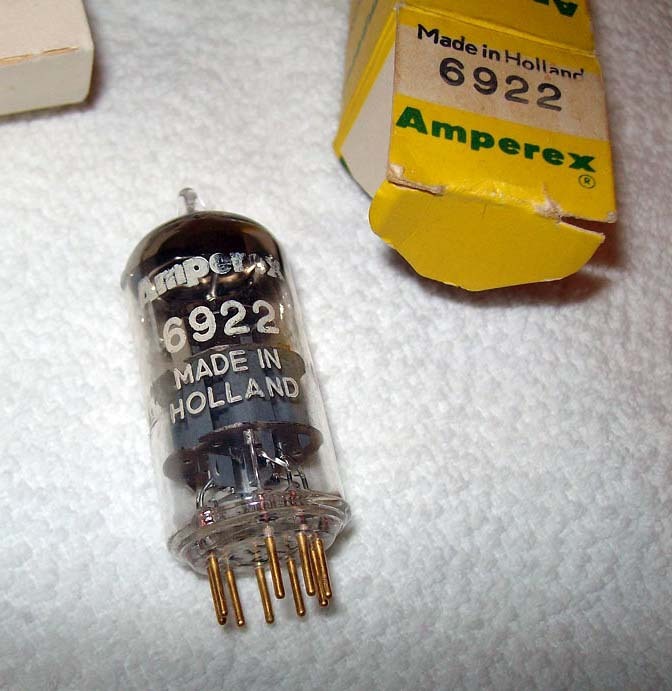 Amperex pinched waist 6922….yes it’s a very nice tube indeed and as Eico points out it’s prone to noise and microphonics but there are many other great 6922 / E88CC / etc out there that not only equal it but surpass it in some aspects. As a tubeophile for the last thirty years I’ve tried most in a variety of associated components and it’s clear to me that the ‘perfect’ 6922 or any other tube type for that matter does not exist because the tube being used at the time needs to work with the existing kit/room/ears. A pinched waist Amperex 6922 WILL NOT be the ultimate tube in EVERY position in EVERY system for EVERY listener, it needs to part of the overall blend. Scour the net and you’ll see various reviewers or sellers all with a different opinion of what in their eyes (or ears actually) is the ‘killer’ tube for any particular type, 6922, 12ax7, 12at7, 12au7 etc etc, views are NEVER identical and often the complete polar opposite. Obviously we have two different set ups and each set up benefits from a slightly different tonal blend of a particular tube. Tonal blend apart there seems to be a ‘quality’ or ‘goodness’ element to a select few tubes that perform consistently well no matter what. The Amperex pinched waist falls well into this category but it’s not ‘the holy grail’ by any means. Siemens CCa regularly takes the crown for me. Siemens E88CC has several guises, they all sound different BUT they all sound exceptionally good and I can nearly always find one that ‘works’ in whatever position. To me these at the ‘holy grail’ tubes because they have something special to all ears and all systems, they are my ‘go to tubes’ for any new piece of kit and consistently produce great music. Mullard E88CCs are another superb sounding variety but microphonics can be a problem with some so buy with caution if you’re using them in an early pre amp stage or phono. If you like that silky soft smooth tone then plain old Mullard ECC88s are hard to beat. You definitely point out a flaw in my initial post by highlighting the importance of individual taste and system matching & its influence on one’s opinion on the 6922 (or any other) tube type. I also very much like MOST of the Siemens versions of the 6922/E88CC/CCa/6DJ8…. The best of them have better transparency and low level detail resolution than ANY other tube in this family. In THAT sense they are “the kings” of the 6922s. The most desirable and highest-performing versions of what are often just called “Siemens” 6922 & CCas are the E88CC and CCa tubes that come in the famous blue and yellow boxes & retain the “Siemens Und Halske” name and were made before 1967. The later versions, in particular the A Frame version (the getter is supported not by a metal bar or rod but by a structure resembling the outline of the letter A) made in the early 1970s are merely OK and IMHO not worth the prices they fetch. The post-1977 Siemens 6922 tubes are not worthy of high-end systems IMHO. Again, just my opinion. To be fair, the Amperex USA 6922s made from 1979 onwards are also pretty useless IMHO. Your point about system matching, individual sonic preferences (and, as I have found, musical tastes) is well taken. One man’s “ultimate” 6922 is another’s “very good” 6922. So, yes, in some sonic qualities I agree that the best Siemens Und Halske 6922s are the best of all 6922s..
BUT… in all the various 6922 preamps I have owned since the mid 1980s, I have always found that even the earliest Siemens Und Halske 6922s and CCas… how to say it.. lack a certain “je ne sais quoi” that the Amperex USA family of 6922s have in spades. The Siemens Und Halske CCa/6922 tubes always sound a little TOO refined; a bit too… clinical.. as compared to even late 1960s Amperex USA 6922s. To my ears. The Amperex USA 6922 “house sound” simply (for me and many of my audiophile friends and correspondents) has more energy, more treble ambience and air…more BREATH than the Siemens Und Halski CCa/6922 tubes deliver. Even the earliest S&H 6922s ever made. Of course, to paraphrase your fine post, opinions about “the best 6922” are like belly buttons: EVERYONE has one! But for me, Amperex USA 6922s have an energy, vibrancy and musicality that is unmatched. Just like 1950s-vintage square getter, long plate “MC 1” coded Mullard 12AX7 / ECC83 tubes just have “that certain magic” not found in any other 12AX7 variant.. so too does the Amperex USA 6922. The early Siemens Und Halske 6922s ARE so good that I can easily understand the many audiophiles that regard them as superior to any other tube in the 6922 family. Oops! Major “brain fade” today! I just happened to have sold a quad of late 1960 USA Amperex to a friend so they are very much still on my mind. Sorry for the confusion; my comments in my above post from 9/1/16 refer to the DUTCH Amperex E88CC/6922, NOT the USA. The USA Amperex is very nice, but my comments are about DUTCH Amperex above.